Forme ATT Carbon TT Bike 54cm (top tube to centre of bottom bracket) with HED3 rear (conti tub) and a pro-lite deep front rim (vittoria corsa evo cx tube). EPS-R Exustar clipliss pedals. Also included is the standard spoke wheels which have 4ZA cirrus hubs and rims with schwalbe ultremo cx tyres but no cassette or skewers (fitted them to the aero wheels). Bike bought new end of April 2016 and has not been ridden since October of that same year. 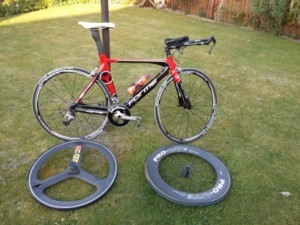 Front and rear aero wheels bought used May 2016. Open to reasonable offers. Viewing is welcome. 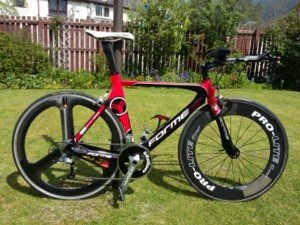 Bike is kept in Smithton, Inverness. Cash on collection or delivery (50 mile radius from Smithton). Also have shimano rp3 shoes size eur 46 and a giro aero helmet open to offers.